Always prompt for customer – If set to prompt, each time a user creates a POS order, they will be prompted to enter a customer. Otherwise a default ‘cash’ customer can be set and used. Accumulate Items – If an item is added to a POS order more than once, the quantity is increased instead of adding the item on a new line to the order again. Home Page – An html location to display in the left hand pane of the POS. This is used for display ads to the screen. Retain Order number on Copy and Credit in Sales History – If set, the same order number will be copied from history. If not, then it will get the next available order number. Convert quotes to Sales Orders with next Order Number – This will change the Quote number to the next available sales order number. The original Q number gets saved as well. 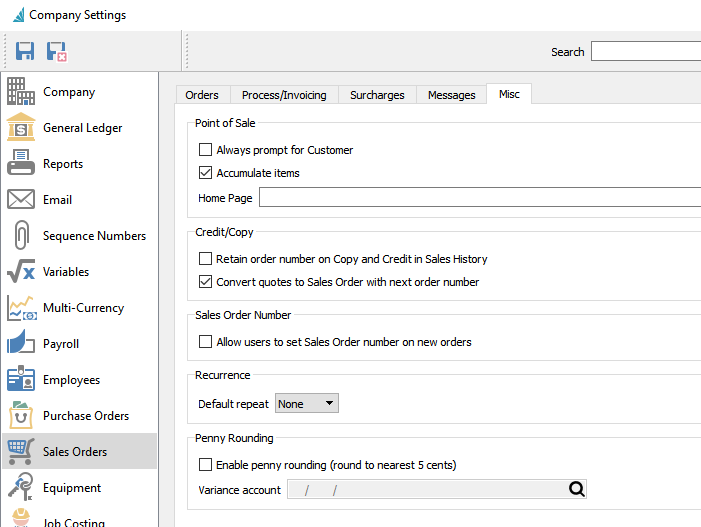 Allow the users to set the Sales Order number on new orders – Users can override the next available order number in sales orders. 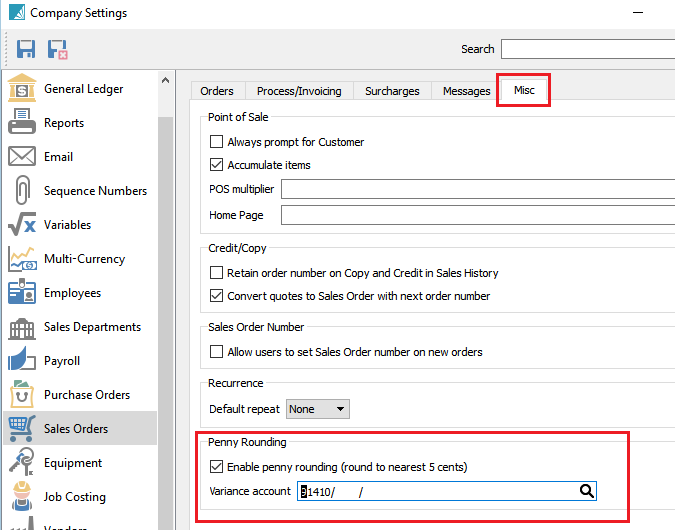 Default Repeat – Select None, Daily, Weekly, Monthly or Yearly for the default repeat cycle on a standing sales order. Enable penny rounding (round to nearest 5 cents) – This setting rounds cash payments to the nearest 5 cents. Variance account – Select a GL account where the rounded difference will be posted.